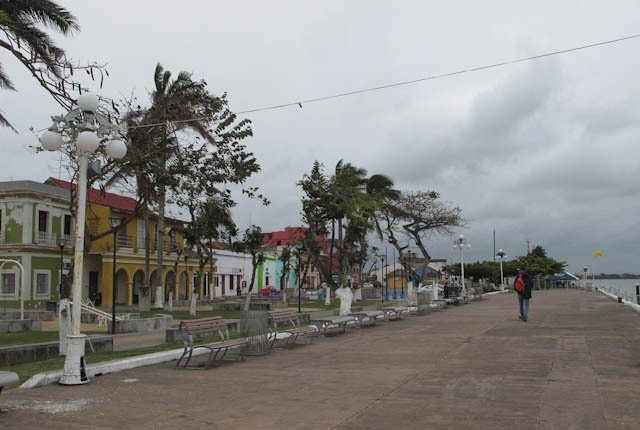 Tlacotalpan, Veracruz, is a small city with a population of almost 9,000. During the 24 hours we spent there, we saw probably less than 50. Where were they? 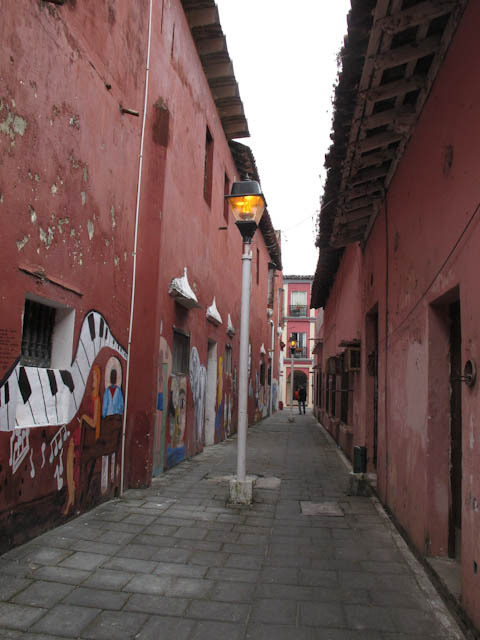 Walking the streets was a bit eerie, as the streets of Mexican towns and cities are usually full of people walking, talking, eating, and laughing. Few stores or businesses were open. 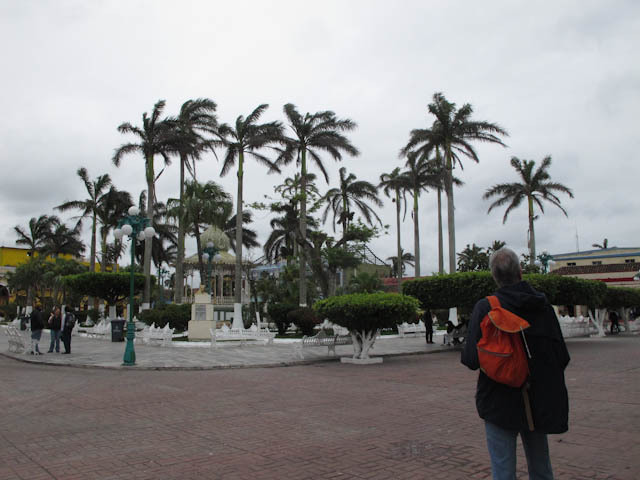 Granted, the blustery gray day wasn’t the best for outdoor activities; apparently they were experiencing a “norte,” the local name for cold fronts from the north that dominate the weather from October to April. Still, I’ve never known a little cold to hamper socializing and shopping! 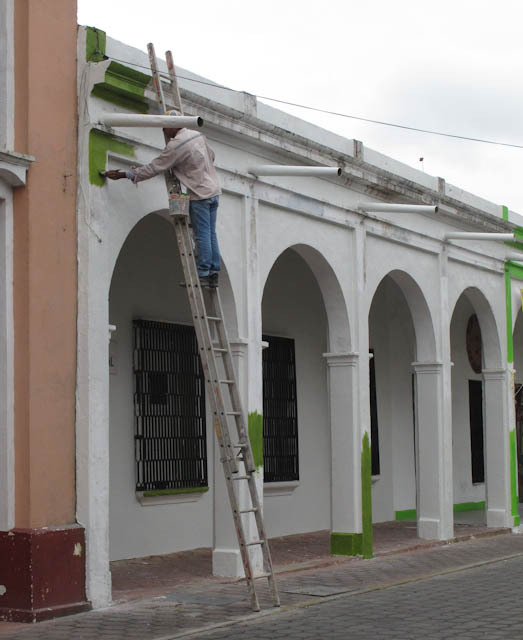 UNESCO granted World Heritage Site status to Tlacotalpan in 1998 partly due to to its graceful style of architecture. 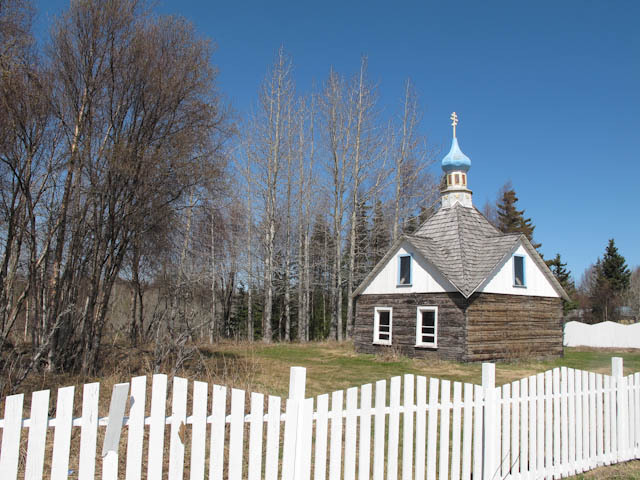 Click on any photo in the gallery for a slideshow. 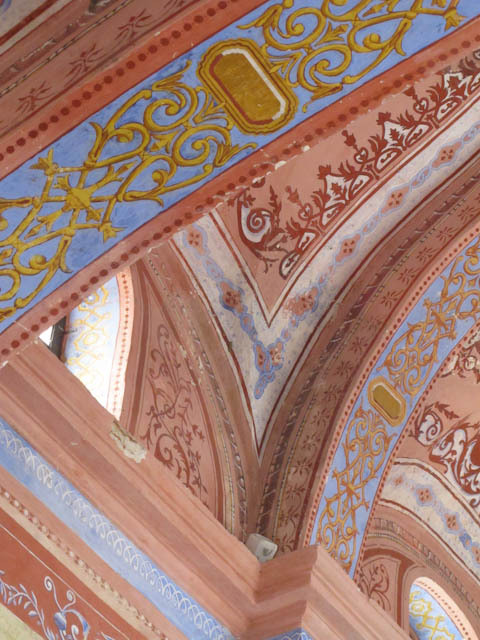 The reason for including colorful arches on the logo is obvious – and if your building doesn’t have arches just paint them on! And out….I was glad to see that no one was on the scaffolding this windy day! A few hardy souls braved the brisk wind! We strolled the streets and enjoyed the artwork and other intriguing sights, but we never found a hot coffee nor a cold beer! Street scenes in tile decorated many park benches. We couldn’t figure out what this was, and there was no one around to ask! Ideas anyone? Elegant woodwork trimmed doorways throughout the city. 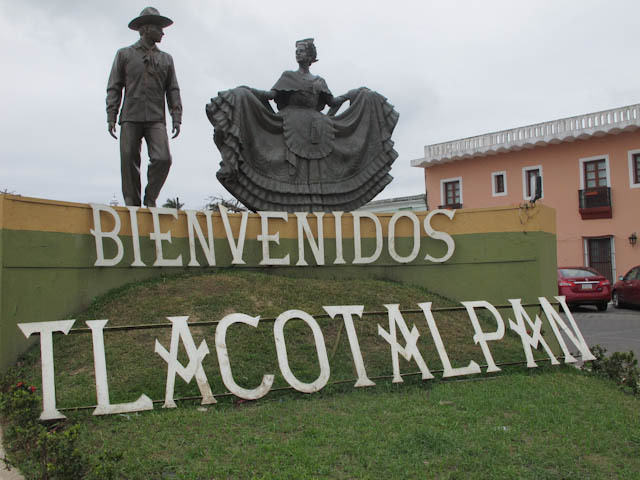 Tlacotalpan is well known for its Feb. 2 festival “Our Lady of Candlemas.” If you are looking for action, I recommend visiting then. But you are welcome anytime! 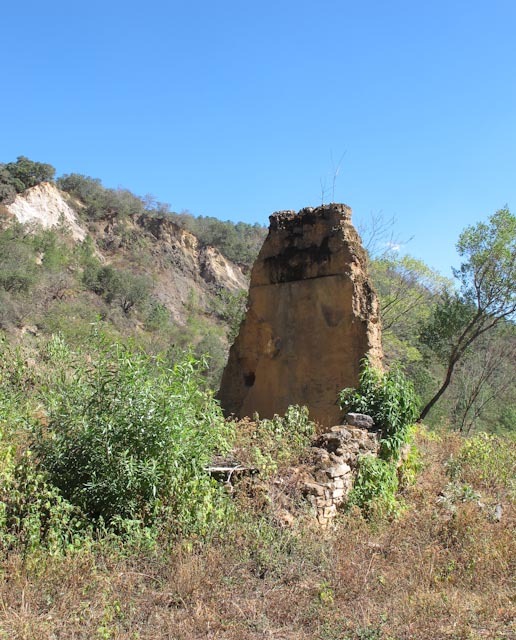 Spread along the Rio Papaloapam, high in the Sierra Norte north of the city of Oaxaca, are the ruins of Spanish haciendas that were built and inhabited during the years of Spanish exploitation of the mineral riches of the area. 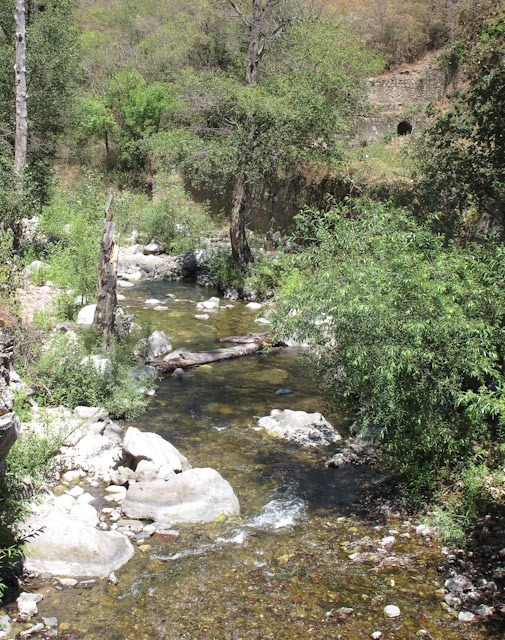 According to historical records, Cortés learned of the possible existence of gold and silver in the Sierras and immediately sent scouts in search of the minerals. They returned with the news that the mountains were indeed rich with gold and silver ore, and Cortés, ever the opportunist, claimed the entire Central Valley of Oaxaca for himself (year 1521). The Spaniards built the infrastructure needed for mining operations and constructed aqueducts, large haciendas, stone bridges, and a church. 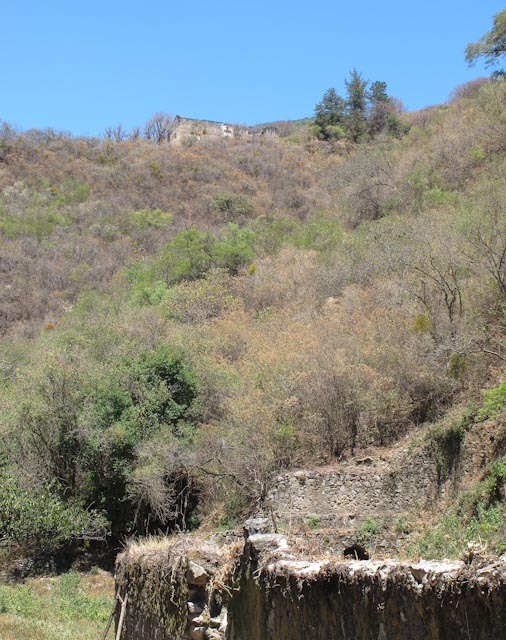 These remains are located deep in a lush valley near the villages of San Miguel Amatlán and Lachatao. 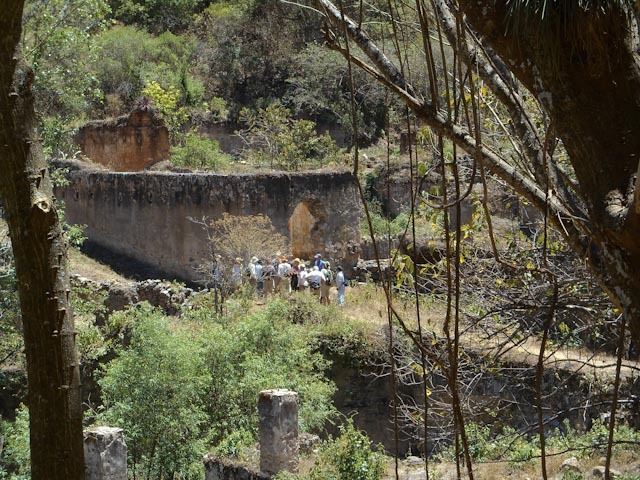 The Friday hikers explored El Socorro, the first section of the Spanish ruins. A sinuous highway (the highway signs said so!) led us through seemingly endless mountains that offered spectacular vistas. Local people navigate narrow gravel roads that zig-zag up the mountainsides to their villages. 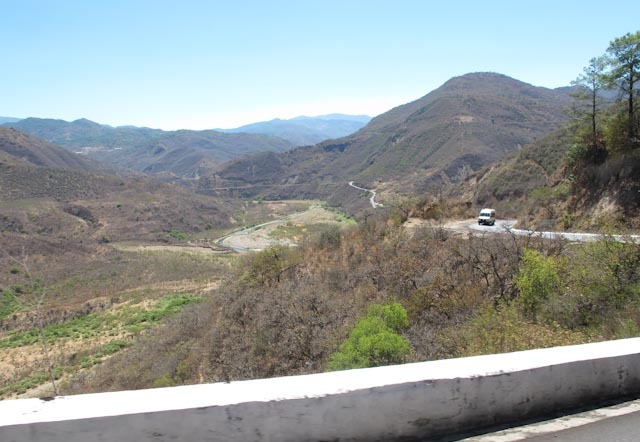 After climbing to the mountaintop to pick up our guides in the tiny village of Amatlán, our excellent bus driver maneuvered to the valley floor on a dirt road that was clearly not designed for a school bus! He received a loud cheer and applause when we reached the fork where the hikers got off and started down the trail, while he continued on to a wide spot where he was faced with the daunting task of turning the bus around! The guide said it’s a casa de arañas, or spider house. Friendly spiders, of course! Trout were visible lazing in the shadows of pools in the clean, clear waters of the Rio Papaloapam. Epiphytes grow anywhere and everywhere they can find a resting place. 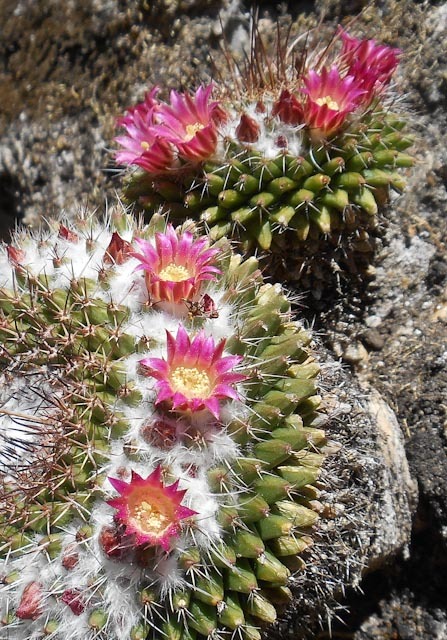 Some cactus favor the tops of old stone walls, while other prefer to just hang around. 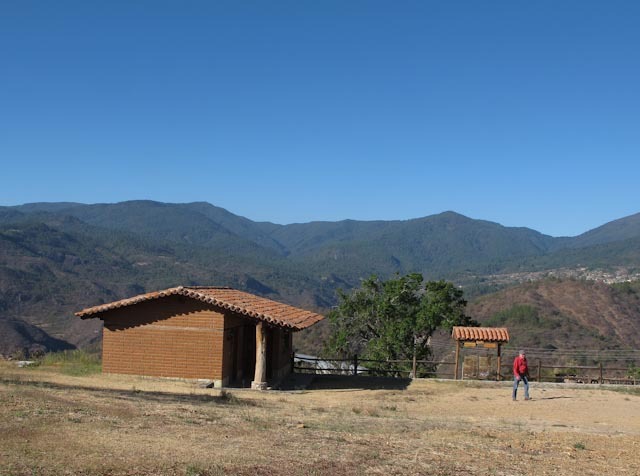 At the end of a long day of busing, hiking, and exploring…what could be better than relaxing and spending the night in a cabaña with a view! 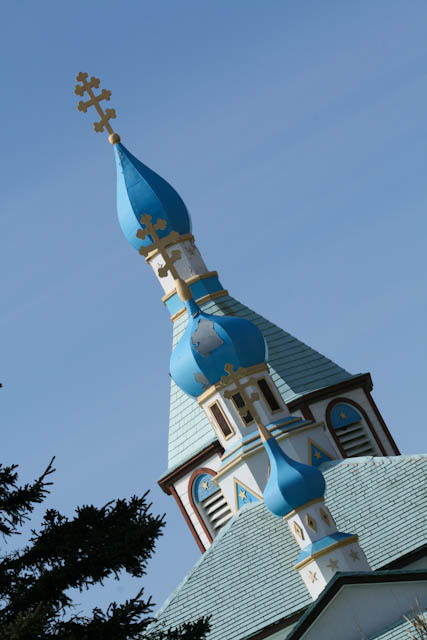 Several of the photos in this blog were taken by my husband, David, who has become a hiker and photographer too! 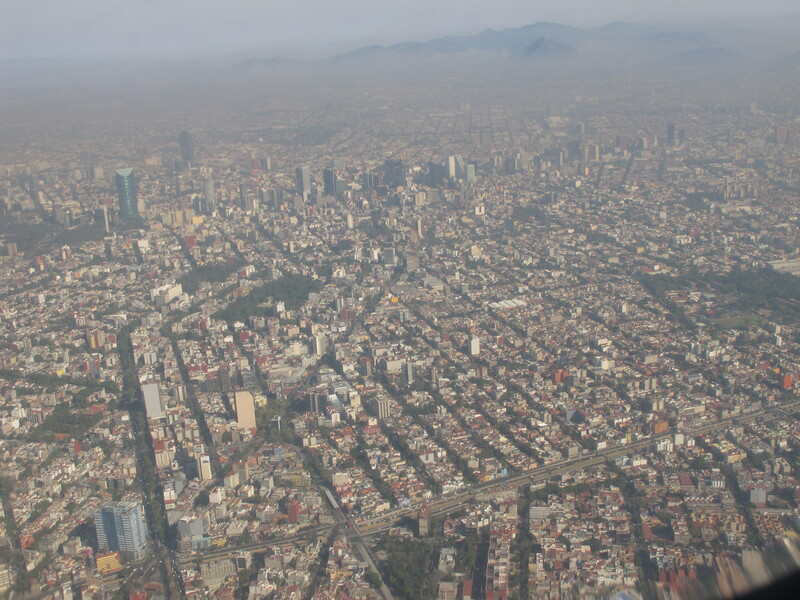 Viewed from the air, the metropolis of Mexico City is awesome in its enormity. Located in the Valley of Mexico at an altitude of approximately 2200 m (7217 ft.), the city embraces the surrounding mountains and creeps up their slopes. The city and its 25,000,000 inhabitants are guarded by (or threatened by!) the active volcano Popocatépetl, 5426 m, (17,802 ft.). 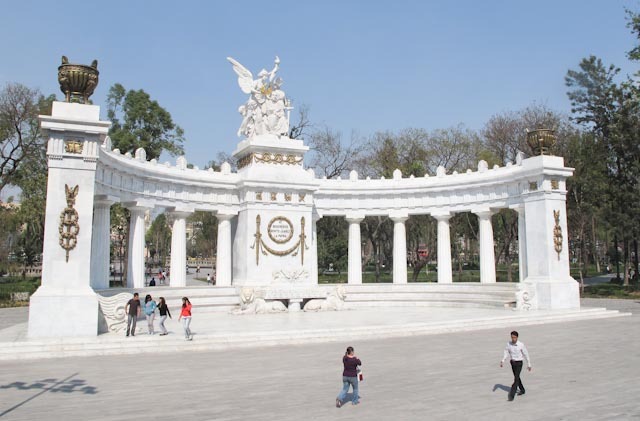 Tenochtitlán, the original Aztec city on this site, was conquered by the Spaniards in the early 1500’s, and they eventually rebuilt the city in the Spanish Colonial style. 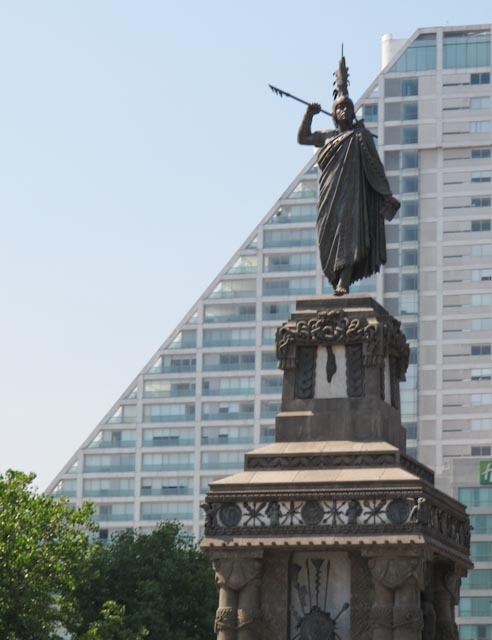 During a recent bus trip from Oaxaca to Colima, we spent a couple of nights in Mexico City. The open top of a double-decker bus was the best way to get an overview of the historical city center. Tree tops shaded us and sometimes brushed our faces as the bus wound through commercial and residential areas. Sleek modern skyscrapers contrast sharply with elaborate styles of the past. 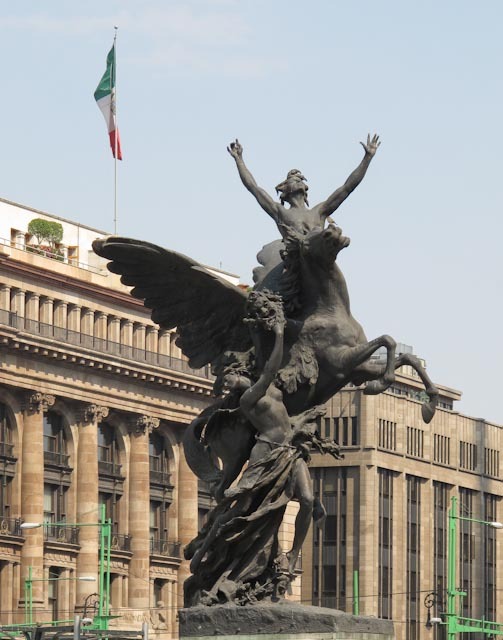 We definitely look forward to exploring Mexico City in more detail!